Appearance (0-20): Right off the bat, this cigar looks delicious. 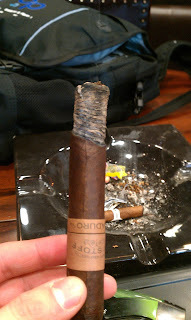 It boasts a dark brown, oily maduro wrapper. The cap of the cigar has a pig tail, and there is a closed foot on the opposite end. It comes wrapped with a light brown band that is made of some type of plastic/cloth material. Overall, everything is very well done and quite inviting. Construction (0-20): Everything from start to finish was very good. The cigar was wrapped to perfection from foot to cap. It light up quickly from the closed foot, and gave a very long slow burn. The draw yielded quite a bit of smoke, and it still burned for close to 1.25 hours. 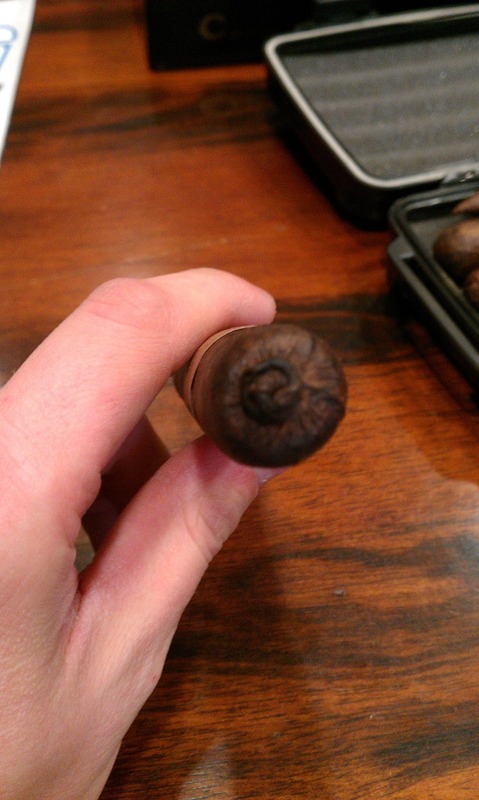 The ash coiled nicely, and held on close to 2 inches before falling off. Strength (0-20): As far as strength goes, this would probably rest in the medium-full range. There is definitely some ligero filler that gives off nicotine strength. Coupled with that, you will get a full flavor cigar that is quite satisfying. Flavor (0-20): The flavoring was very rich and robust. The strongest notes that come through would most definitely be sweet chocolate. As you smoke down, you will get hints of coffee and earthiness. Each puff will also present some spice. The spiciness is subtle, but it really gives a strong balance to cut back on some of the sweetness. Very well balanced! Value (0-20): I think Kristoff did a good job pricing this one. Physically, this cigar is beautifully constructed. It’s one of those cigars that you can tell that it will be good. $8 sounds spot on. Overall (0-100): This was the first Kristoff that I’ve been able to try. If the rest of the product line stacks up to this, I will be a return customer. 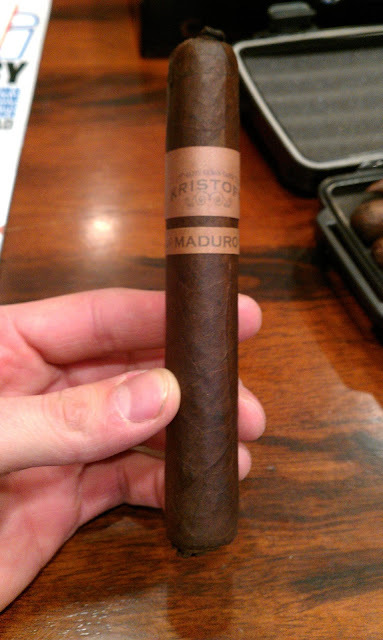 The Kristoff Maduro was pleasing to the eye, long burning, and very flavorful. While none of the factors really “wow’d” me, I would mention that everything was well done across the board. I love this cigar for producing a big thick smoke.The pepper did not change the taste too much and all the flavors collective very well for a very smooth taste.